That dial looks pretty clean, doesn't it? There's good reason for that - it's a redial. I didn't buy the watch looking like this. The dial originally had some damage, particularly to the "Hamilton" name, and I intended having it redone. This is the result, and I'm none too happy with it. There's just too much amiss with the redial for me to be satisfied with it on such an otherwise nice watch. I generally avoid watches that require redials as I have a pretty poor opinion of the quality and suitability of the bulk of redials I see. However, as the original dial finish was not in a state I was happy with this was an opportunity to experiment and see what I might get. The style of the redial is too far from the original and there are a number of quality issues I have with it. The redialer advised they did not have the correct printing pads to replicate the original dial design, and so I agreed for them to do what they could. Below you can see the original and the redial - these are low-res pics from the redialer. In the end the only aspect recreated correctly was the minute chapter ring. Note that the change of style of the subseconds dial meant the original seconds hand from the watch would be too long and and a new one needed to be found. Quite annoying, that. Remember, this was an experiment from my perspective and, notwithstanding the changed style, I wanted to assess the quality of the printing in my hand. The low-res pic did not give me enough of a gauge as to the printing quality and finish. The printing is not as crisp as I would prefer and I'm concerned about the spacing and size of some of it. Also, the overall finish is unlike what I am accustomed to on Hamiltons. Carrying the watch again today just reinforced my feelings - the redial is not of a quality that satisfies me. What to do? I suppose I could have had it redialed again, and perhaps again, until I got something I could live with. Note that this was a standard redial not a "collectors" grade one which the redialer also offers. Frankly, without assurance of much improved quality, and given the increasing cost, I considered I would be better off looking for a replacement dial and that's what I did. 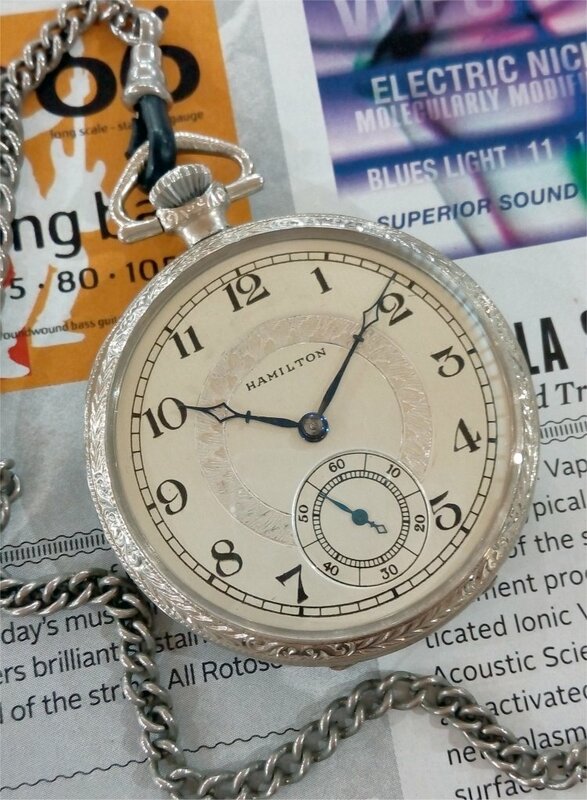 As these early Hamilton 12 sizers are actually 14 size you need to be discerning when looking for dials that will fit correctly. 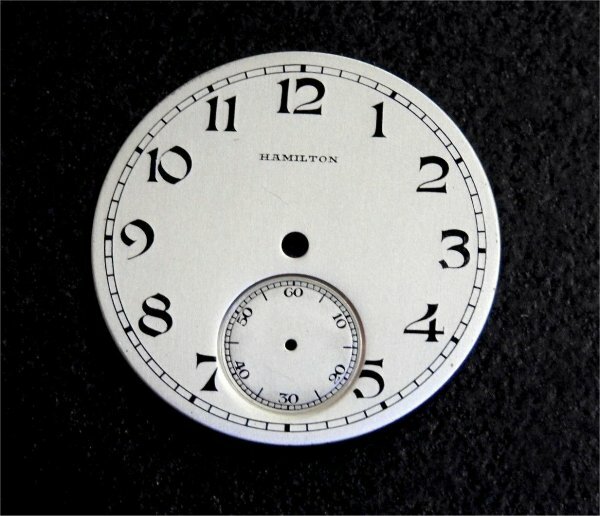 Below is a Hamiton "12" size dial I found that should fit. 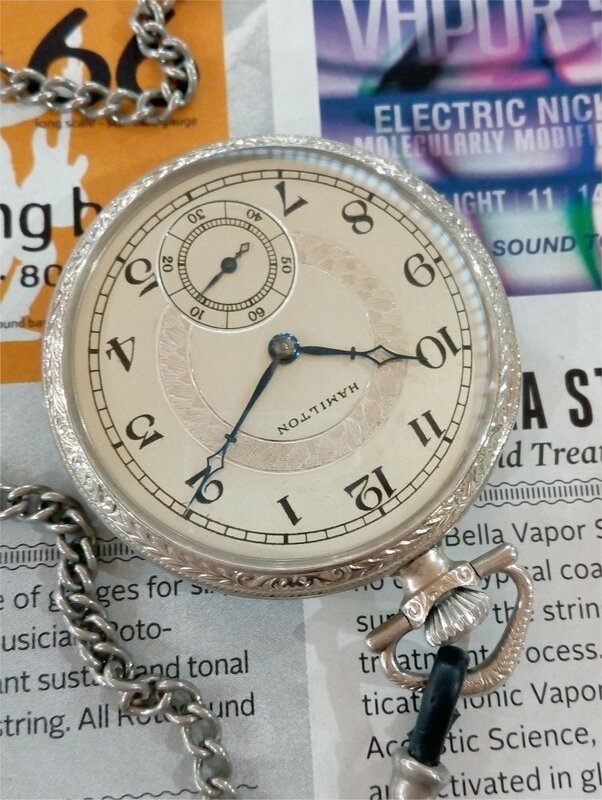 It's a solid silver dial in excellent condition and in a style I think will work well with the watch. We shall see. I haven't as yet gotten around to fitting it but hopefully it will return to this quality watch a dial worthy of it. Here's a shot showing the movement. 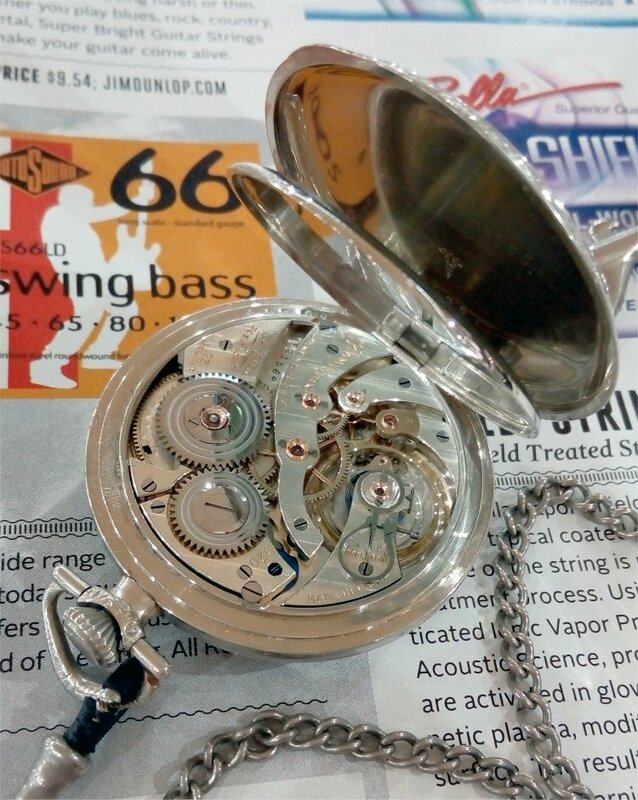 The Grade 920 is a 23 jewel bridge style movement with jeweled motor barrel, gold jewel chatons, swaged rose gold train wheels, Reed's fine regulator, and adjusted for temperature, isochronism and 5 positions. 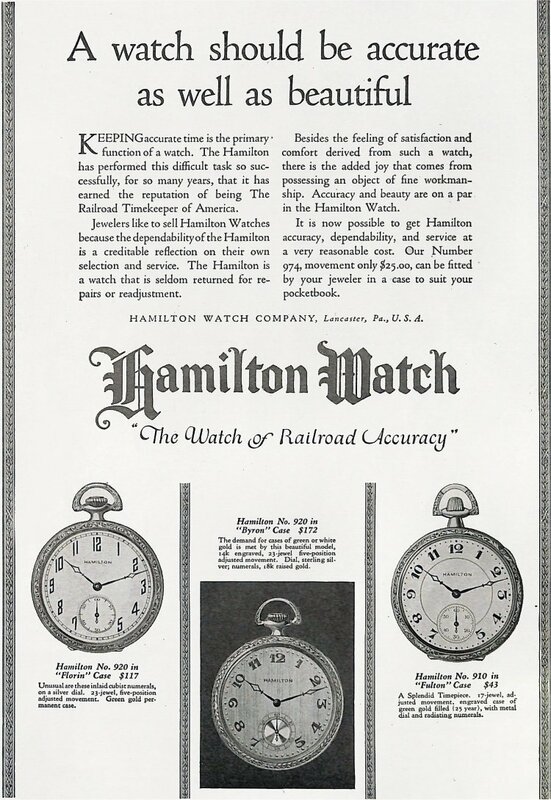 Hamilton produced these very fine movements from 1911 up to 1924. 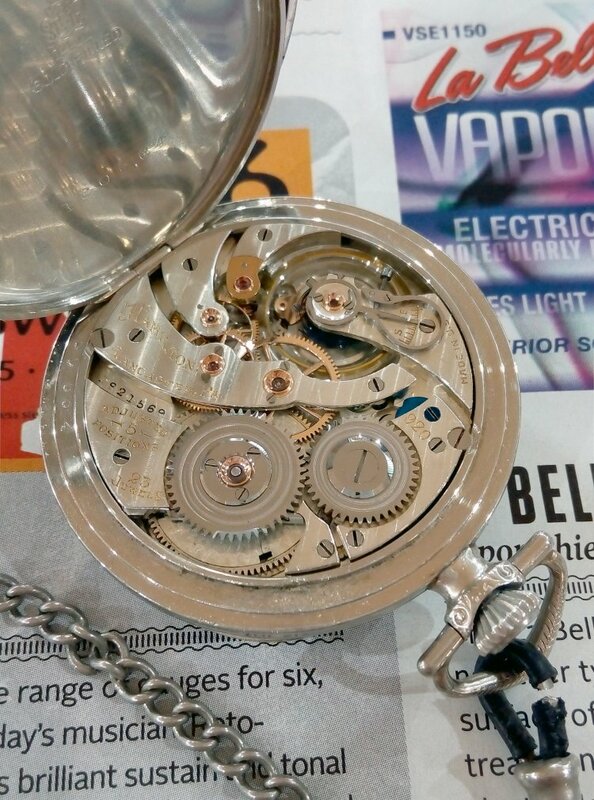 The movement in my watch was was found to require a fair bit of work on the escapement when I sent it to Rob B for servicing, as well as a new mainspring and polishing of steel parts. The watch also received a new crystal. The Hamilton-marked embossed case is in 14K white gold fill and carries the caduceus mark of casemaker Joseph Fahys & Co. The case measures 45.5mm in diameter and is 8.8mm thick. 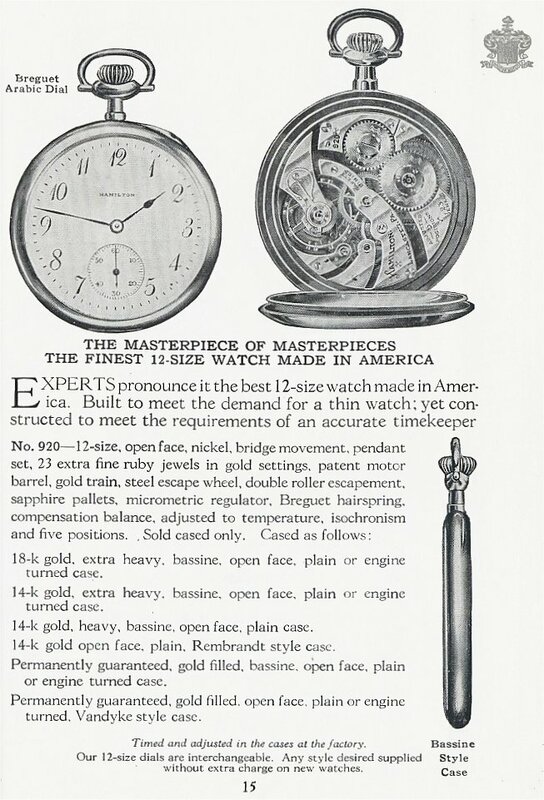 This 1923 Hamilton ad from "The American Magazine", contemporary with my watch, shows a couple of Grade 920 watch styles.